Per his military service record (regimental no. 4617), Joseph Patrick Wallis was born at Darlinghurst, N.S.W. He gave his age as 18 years and 4 months (though he was younger), his marital status as single, and his occupation as seaman. He undertook a preliminary medical examination at Trangie on 6th October 1915 (where he gave his occupation as stableboy, and address as 9 George Street, Burwood). His description on his medical was height 5 feet 6 ¼ inches tall, weight 112 lbs., with a fair complexion, grey eyes, and light brown hair. His religious denomination was Roman Catholic. He joined the Coo-ee March at Dubbo. He completed his medical on the 13th October 1915 at Dubbo, and was attested on 13th October 1915 at Dubbo. He claimed to have had no previous military service. On his embarkation roll his address at time of enrolment was Wollara Wollar, via Mudgee, N.S.W., and his next of kin is listed as his aunt, Mrs Sarah Doyle, Wollara Wollar, via Mudgee, N.S.W. (This was later changed in his service record to his mother Mrs Jane Wailes at various Sydney addresses). Private Wallis departed Sydney on the HMAT A70 Ballarat on the 16th February 1916 as 14th Reinforcement for the 13th Battalion. He arrived in Egypt on the 22nd March 1916. On the 1st April 1916 he was transferred to the 54th Battalion. He embarked on the HT Caledonian at Alexandria on 19th June 1916, and disembarked at Marseilles, France, on 29th June 1916. He was killed during the Battle of Fromelles in France on 19/20th July 1916. He was originally listed with “No known grave”, and commemorated at V. C. Corner Australian Cemetery and Memorial at Fromelles. His body was identified in 2010, and was buried in the Fromelles (Pheasant Wood) Military Cemetery, France. Private Wailes’ name is also commemorated on panel 160 on the Australian War Memorial First World War Roll of Honour. 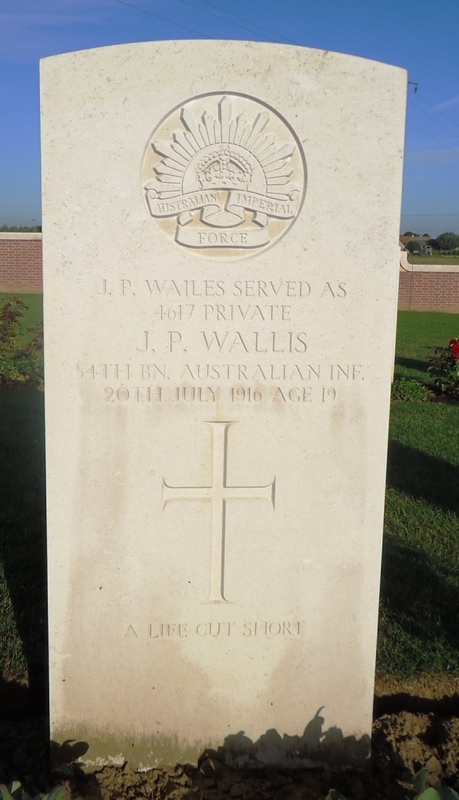 Research note: The NSW Birth Certificate for Joseph Wailes shows he was born on 28th August 1898, so he was actually only 17 years and 1 month when he enlisted with the Coo-ees, and 17 years and 10 months when he died.